Read, in his own words, of the threat to all he held dear - and the lengths he must go to defend it. This July brings all the things you might expect to follow the longest (or shortest) day of the year, including swords, blood and vampires. Of Angel's Blood doesn't try to make Deimos "human" again and pit him against the same struggles. The changes he experienced in A Life in Blood become his new normal and the darkness he faces becomes subsequently tougher. Currill dares to do the right thing and explore what happens when Deimos must face the absolute evil of his new vampire family. When it counts, he doesn't shy away. Instead, he includes us and draws us down with him in the open, blunt and sometimes shamefully painful way he does in book 1. He brings us along in a desperate and consuming challenge to who he is and I could not look away. Deimos remains an articulate and consistent narrator who continues to bring his observations and feelings to life. I also loved his dialogue and the way he brings his friendships to life. Second only to Deimos himself, the real people he surrounds himself with give this story heart and make all the action meaningful. Of Angel's Blood has the courage to ask what happens when we step completely away from who we are and what happens to our very selves when we get to the other side. When the path is dark and desperate, will the soul remain intact? Turn on some lights and get yourself a copy. Deimos Black continues to mark all the X's in blood. Deimos Black, former vampire hunter and human, has already shared both the best and worst days of his "life" with us. 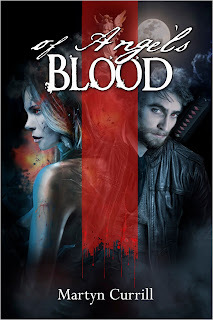 Through his insurrection and assassination of Sharriana Grey, former leader of the Order, he's brought a tentative peace to the world's vampires. With this peace, however, comes what may be his undoing. A dark, malevolent power rises against him. Vampires killed or driven mad by indescribable means pile up and Deimos himself becomes the focus of the being who seeks to consume all he holds dear. Read, in his own words, the lengths he must go to defend everything and most importantly, himself.